Kayla is a Music Education major entering her fifth year with the UCMB. 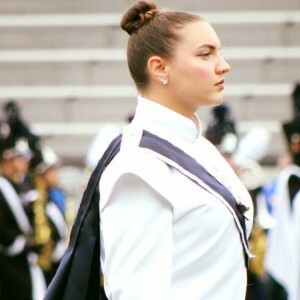 She is originally from Long Island, New York and served as Color Guard Captain and Head Drum Major of the Lindenhurst High School Marching Band. Kayla has spent her time in the UCMB exploring different sections, such as piccolo, color guard, and mellophone. Beyond UConn, Kayla is also Color Guard caption head at Plainfield High School for both the Fall and Winter seasons. Kayla loves the marching arts and hopes to do everything she can in her career to promote the arts, and inspire her students to live a life full of music and performance. She is incredibly honored to be serving for her second time as drum major of the UConn Marching Band, and is looking forward to all of the friendships and beautiful music to be made this 2018 season!